With this golf swing tip we’re going to have a look at how you can really lower your scores, if you’re out on the course playing and you’ve got caught by a fairway bunker or sand track down the fairway. So in fairway bunkers you’re still going to have a lot of distance to travel to get to the green, and if your only option is to play splash shot out, you’re not going to have travelled much distance from the bunker and you’re still going to have a really long way to get to the green. It’s going to start putting pressure on you and you’re going to start chasing the score on the hole, that’s when you start making mistakes and miss hitting shots. So if you’ve got hybrid clubs in your bag, been able to hit hybrids from your fairway bunkers is really going to help you lower your scores because you are going to be able to get the ball much further down the fairway, possibly onto the green and you’re right back in the hole, saving yourself a lot of shots. So have a look at the hybrid you’re carrying, look at the loft that you’ve got on those. Now if you have a look at a lot hybrids that more molten in design you’ll see there are a lot of loft options on them. And if you go to a website such as Thomas Golf, they actually have a whole range of hybrids that go through replacing two irons fairway woods, three irons all the way through the back down to pitching wedge and sand iron. So pick one of the more lofted hybrids, because that’s going to help you get the ball over the leap and out of the bunker. And that’s the priority, get yourself out of the bunker and get as much distance as possible. So once you’ve selected the hybrid that’s going to allow you to get the ball over the leap its going to give you the right trajectory and still give you the distance, then work on the following tips. As you address the ball we need to take this ball cleanly, we don’t want to strike the sand first. So rather than wriggle your feet in like you normally would, just keep your feet on top of the sand, so that you don’t lower yourself into the surface. That’s going to insure the club head swings a little bit higher, swings over the sand, then you take the ball really cleanly, rather than strike in the sand first. We’re also going to play the ball just to the left of center and just lean slightly on the left leg, if you’re a right handed golfer, just place them all the way onto the left side and having the ball in this position with the hands forward slightly will help you just get the slightly steeper back swing angle, and if you swing the club head back slightly steeper, as you swing back down, you’ll attack down a sharper angle and it will ensure that you catch the ball cleanly rather than sweeping in and catching the sand first. So we want to make sure that we catch the ball cleanly. 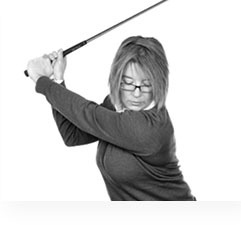 And the final tip I would give you here is just hold slightly lower down on the handle, so maybe making sure that you’ve got a good inch of the handle sticking above your left hand, the reason for this is that’s going to help you shorten the distance between yourself and the club head and the shorter this distance is, the more you are going to swing the club head above the sand. So, slightly hold down on the handle, pull slightly forward, the weight slightly forward, we’re going to work on just picking the club head up and then striking that golf ball, nice and cleanly. And working on hitting the ball cleanly without taking the sand you’re going to get maximum distance out of that bunker. So try those tips, but again, have a look at the Thomas Golf website, and the variety of utility clubs that they offer, because there really is a lot of choice there and you should find this a lot easier to hit your hybrid out of a bunker and still get maximum distance.